Musician and naturalist Bernie Krause is one of the world’s leading experts in natural sound, and he’s spent his life discovering and recording nature’s rich chorus. Searching far beyond our modern world’s honking horns and buzzing machinery, he has sought out the truly wild places that remain, where natural soundscapes exist virtually unchanged from when the earliest humans first inhabited the earth. Krause shares fascinating insight into how deeply animals rely on their aural habitat to survive and the damaging effects of extraneous noise on the delicate balance between predator and prey. But natural soundscapes aren’t vital only to the animal kingdom; Krause explores how the myriad voices and rhythms of the natural world formed a basis from which our own musical expression emerged. The Great Animal Orchestra is the story of one man’s pursuit of natural music in its purest form, and an impassioned case for the conservation of one of our most overlooked natural resources-the music of the wild. 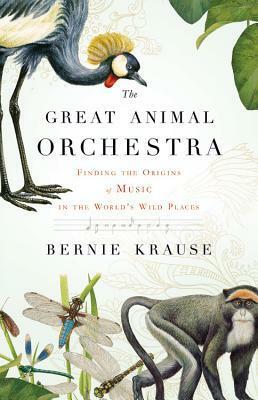 Dr. Bernie Krause is both a musician and a naturalist. During the 1950s and 60s, he devoted himself to music and replaced Pete Seeger as the guitarist for The Weavers. For over 40 years, Krause has traveled the world recording and archiving the soundsof creatures and environments large and small. He has recorded over 15,000 species. He lives in California. This giveaway is sponsored by Little Brown and THREE copies are available. What an interesting way to look at the world of nature! Thanks! Thank you for the giveaway. My grandchildren will love this book!